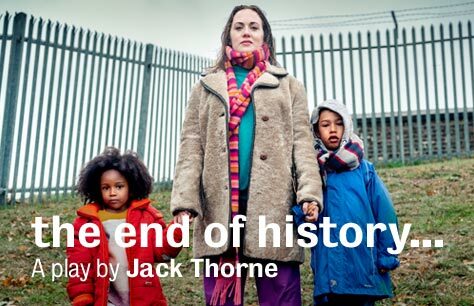 The End of History... tickets are now available for Jack Thorne's newest play at the Royal Court Theatre. It’s 1997 in Newbury and Sal and David have achieved the impossible. They’ve managed to get all of their children back home for the weekend. Sal is trying to cook dinner for the family, something she says she has absolutely no talent for. What she is good at is annoying her children. Carl, the eldest is bringing his new girlfriend home to meet the family for the first time. Middle child Polly is returning from Cambridge University especially for the reunion and youngest son Tom is scheduled to be out of detention in time to join the family for dinner. Sal and David have raised their kids on a steady diet of left-wing ideals and welfarism as opposed to fancy meals. They’ve named their children after their socialist heroes and have big expectations but try not to be the type of parents who judge too much. Prolific British writer Jack Thorne has 5 BAFTA awards to his name. He is known for his television writing on shows such as Shameless and Skins and creating the shows the shows Glue, The Last Panthers, and Kiri. His theatrical works include Woyzeck and A Christmas Carol at The Old Vic. Director John Tiffany has 2 Tony Awards and an Olivier Award for his direction. He has directed Road, The Twits and The Pass for the Royal Court Theatre. Jack Thorne and John Tiffany are the multi-award-winning team behind the wildly successful West End and Broadway runs of Harry Potter and the Cursed Child. They have previously collaborated on Hope and Let the Right One In for the Royal Court. The End of History tickets are only available for 6 weeks, book your tickets to The End of History now to guarantee the best seats at the best prices!